Thanks to all of the attendees, volunteers, and sponsors for helping make this workshop a success! 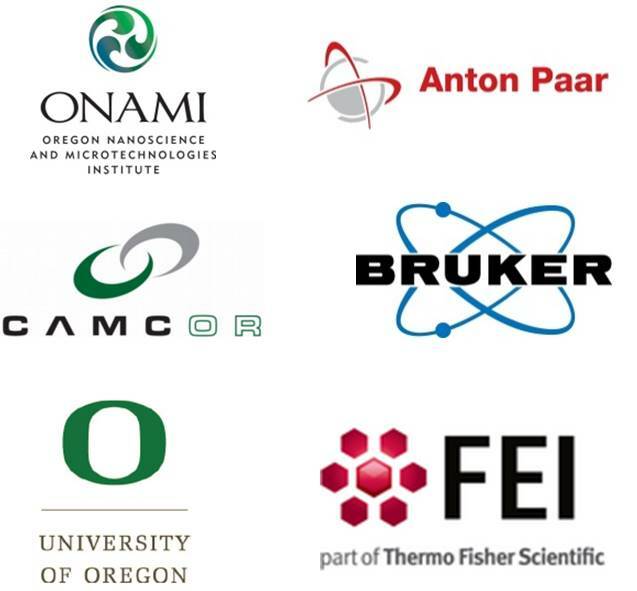 The Oregon Nanoscience and Microtechnologies Institute (ONAMI), Center for Advanced Materials Characterization in Oregon (CAMCOR), and the University of Oregon are proud to present this workshop. Location: Lokey Laboratories, University of Oregon, Eugene, OR. This two day workshop will emphasize the use of multiple instrumental techniques for the characterization of hard and soft nanomaterials. Experts who use complementary techniques to tackle nanomaterial characterization challenges will present on characterization strategies and techniques, demonstrate new analytical approaches, and lead small group characterization problem solving sessions. Participants in this workshop will learn strategies and tips for preparing samples, setting up measurements, and designing multi-technique strategies to address characterization challenges for technologically relevant nanomaterial classes that cannot be solved with individual techniques.